About Vision GLOBAL WiFi Rental Service. 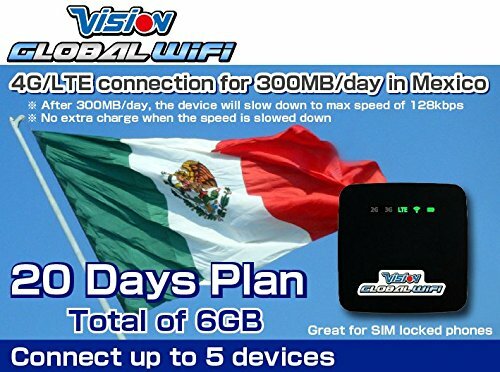 This is a 20-day pocket WiFi rental service used in Mexico. Can be used with any WiFi compatible devices, even with a locked phone. Perfect for traveling and/or temporary returning to Mexico. Enjoy 4G/LTE speed up to 300mb/day, afterwards it will be at slow speed until the next day (local time) with no extra charge. Request your activation to Vision Mobile USA Corp. through Amazon message and return the device when the rental term is finished with the prepaid return label and envelop included in the package.